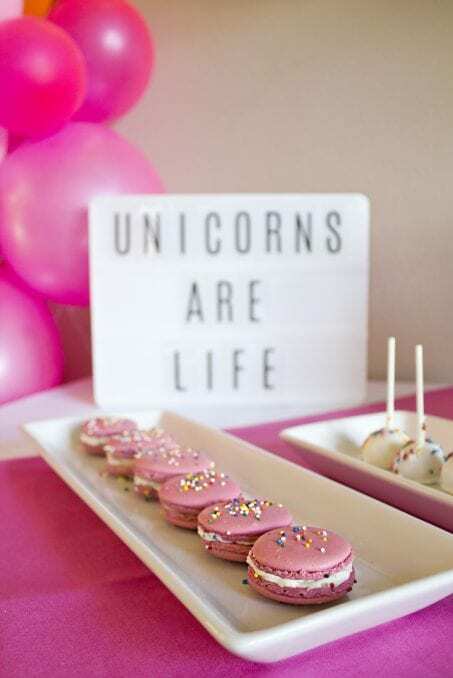 How to Create a Unicorn Adult Party | Check out these ideas for yout party! 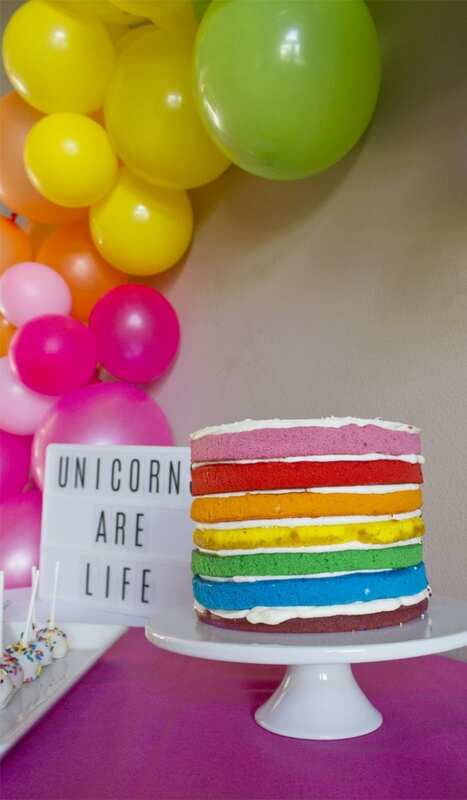 Plan your own super fun unicorn adult birthday party with a DIY rainbow balloon arch, a colorful layered naked cake, and tons of cute rainbow food and decorations! So many fun ideas!! Today I am so excited to share with you something a little different than the traditional DIY you see on A Crafted Passion. I come from a family with just three girls and let’s just say we have a few group texts that go all. day. lonnnng. I love my sisters to death! My little sister is the spunky, fun girl that everyone wants to be best friends with. One day, this little sister went out and got herself a glow-in-the-dark unicorn TATOO. WHAT?! To say she was her niece’s dream auntie would be an understatement. And then she went and bleached her beautiful brunette hair with some crazy rainbow colors underneath! 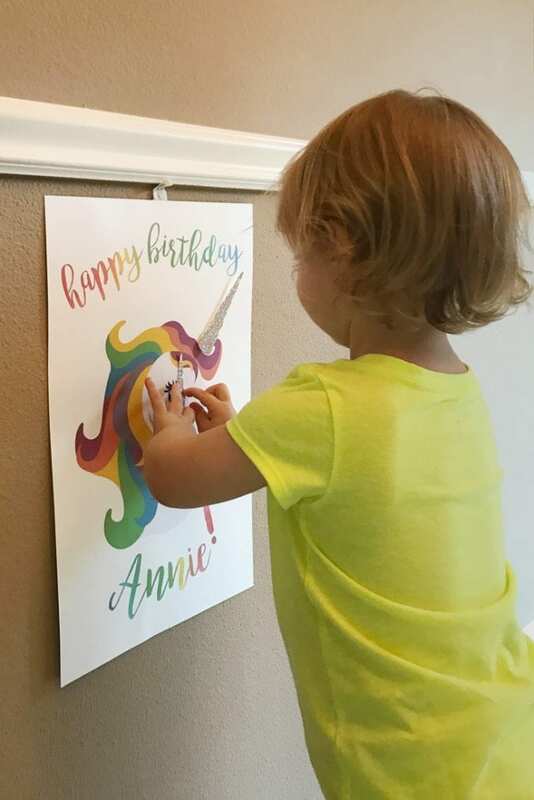 So, not only did she have a 5-inch colorful unicorn stamped on her side, she now pretty much looked like a human unicorn. So, when it came time to plan a little 25th birthday party the theme was easy. 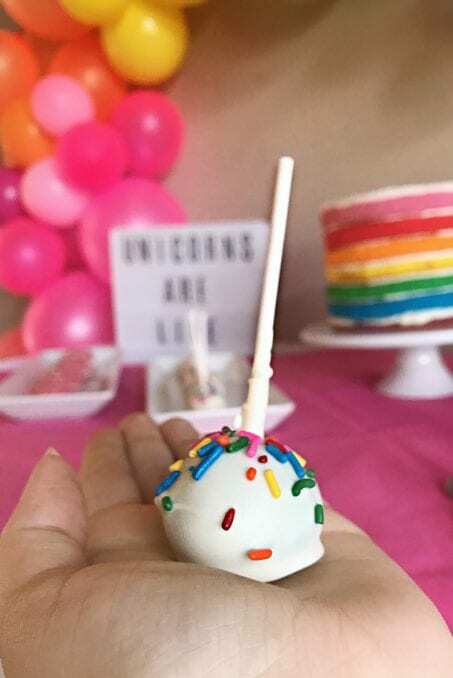 I’m so excited to show you some of those details today and give you some ideas on how you can make a unicorn adult birthday party! These ideas also work for kids too but they just might not appreciate the stunning layered cake as the adults will. *This post contains a few affiliate links for your convience. For more information, see my disclosure here. It may look a little daunting, but after some research and 100s of glue dots, I can tell you truthfully it isn’t that difficult. Just do a quick search on Pinterest to see how to make your own. 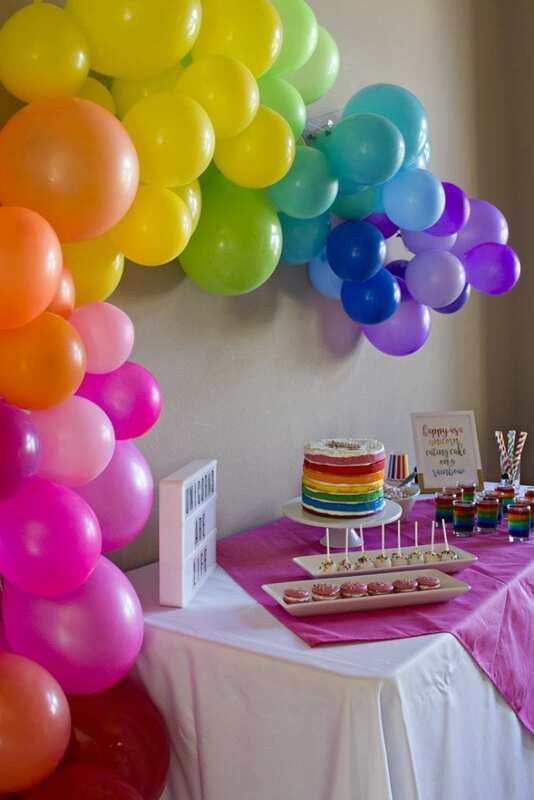 The key is to have many balloons in a multitude of colors and sizes. Of course, we have to start with this cake. It turned out so fun! Certainly no pro cake, but for an amateur I’d give it an A+ (although I might be a little biased). I knew I wanted to do a naked cake and used gel food coloring to get these fun vibrant colors. 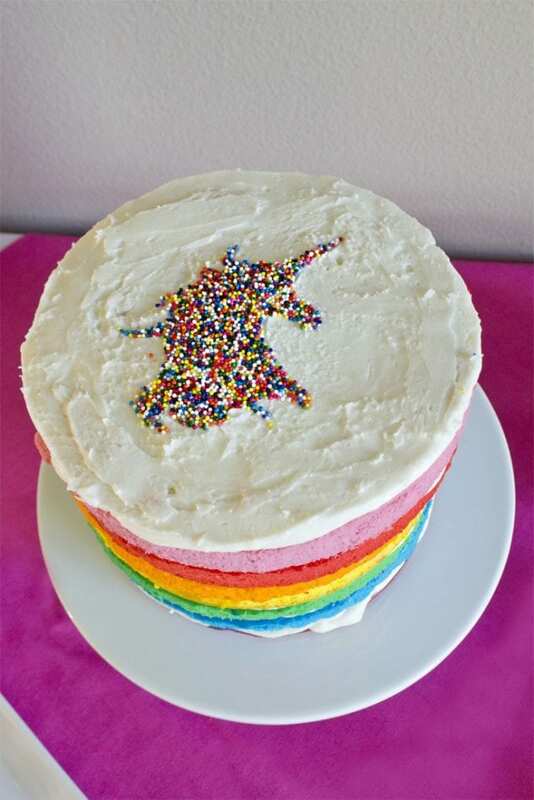 The cake topper was just a simple unicorn design made with sprinkles. I cut the unicorn shape out of wax paper using my Silhouette Cameo. 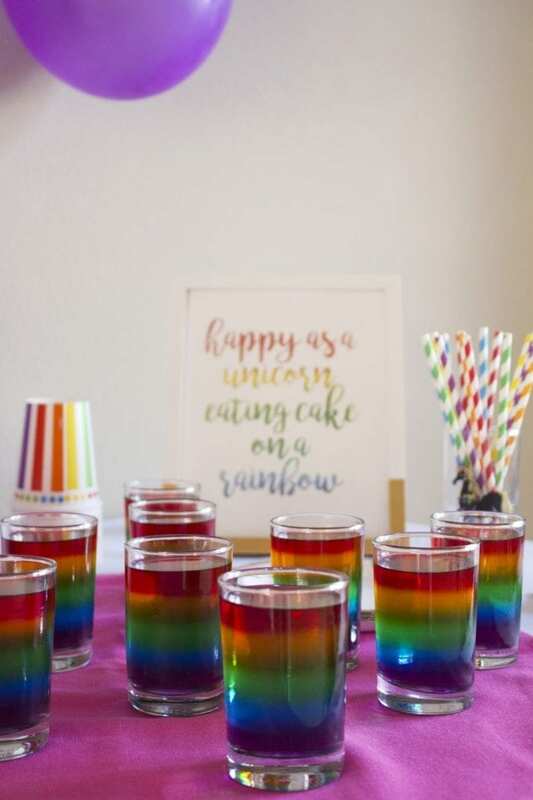 These jello shots are perfect for a kid-friendly party or add a little adult beverage to make them a little more exciting. I just layered flavored jello waiting about one hour in between each layer. This was important so that the layer didn’t have time to set completely so the colors would blend a little. Macarons are pretty much our favorite thing to make right now. Well, I need to give all the credit to Justin. Pretty sure he will be a chef in his next life, but in the meantime he had fun making these birthday cake macarons that were amazing! This macaron recipe from Sprinkles for Breakfast is the one we used. Cake pops are also a fav in our house and SO easy to make. We just used the leftover cake from trimming the edges and top from the layered cake, mixed in some frosting, rolled them into balls, and froze them with sticks. Once they were frozen then I dipped them in melted white chocolate wafers and added some sprinkles. Be sure to work quickly because the chocolate hardens really fast. This game might not be super fun for adults, but the kids sure loved it! All you need is a printed unicorn without his horn on cardstock and then some horns. Feel free to freehand cut the horns or I cut mine out of silver glitter cardstock using my Silhouette Cameo. 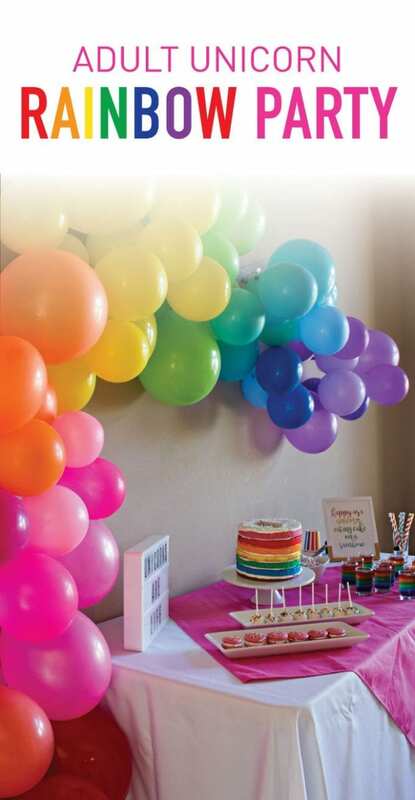 This unicorn balloon from Studio DIY was the perfect party decor addition! And what party is complete without some instax photos! 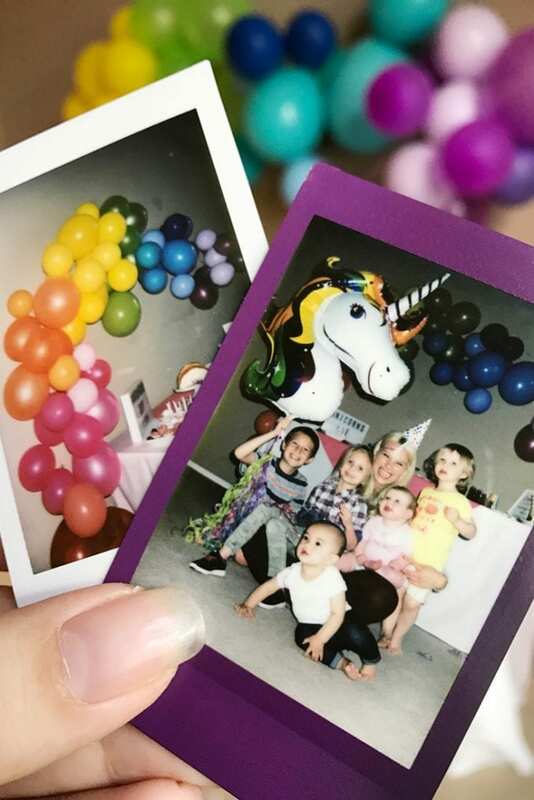 It’s seriously my go-to party tool and these memories were captured so perfectly! Auntie Annie is just the greatest and I’m so glad we could celebrate her! 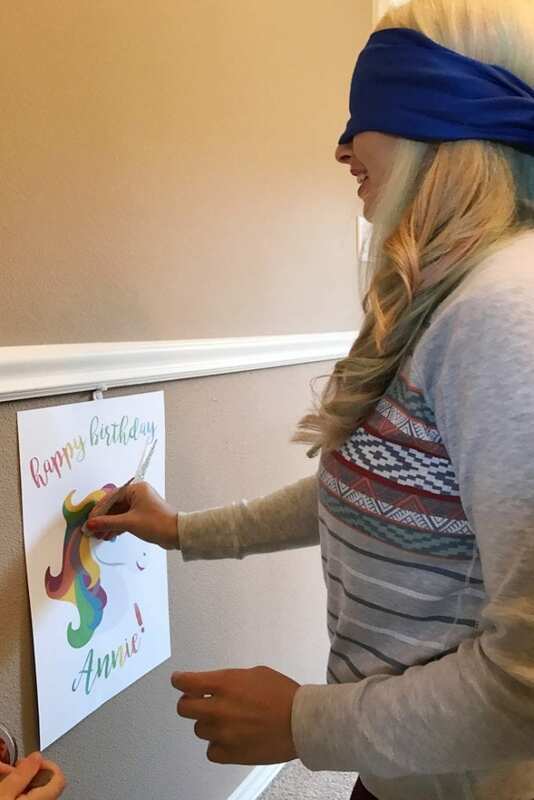 When will you throw a Unicorn Adult Party? If you love this party, pin it here! Check out this black and white birthday party theme and it is perfect for a little one’s first birthday party! See monochromatic food ideas, simple decorations, and budget-friendly ideas on how to throw the best party! This is just the MOST FUN PARTY! My daughter is turning 11 but wanted a party with the whole neighborhood invited–fun adult neighbors definitely included. Hadn’t thought of jello shots for the grownups–great idea! Also the balloon arch is darling and a great backdrop for photos.